Right before we went onstage for our November 28 show, the entire cast of The Critical Hit Show got their pictures taken by the wonderfully talented Evil Patrick Shannon. When we saw the pictures, our minds were blown. 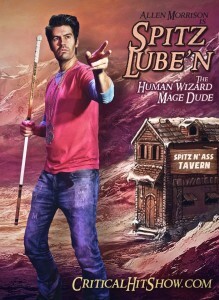 Over the next few days, we’ll post the pictures of the cast, starting with Allen Morrison as Spitz Lube’n, the Mage!